K-DUCER by Kolver is the new class A intelligent transducerized assembly solution from Kolver Hand Tools. What’s including in the system? The transducer solution consists of an advanced state-of-the-art controller and a range of handheld and fixtured electric screwdrivers with torque up to 133 in.lbs (to be extended to 443 in.lbs soon). KOLVER KDS transducerized electric tools cover all assembly line requirements for accurate, high-quality torque and angle-controlled tightening. 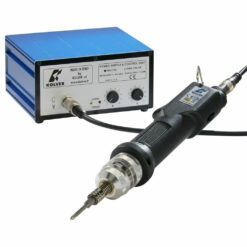 The KDU-1 Series of controllers give you full control of your fastening operation in an industry-leading compact size.